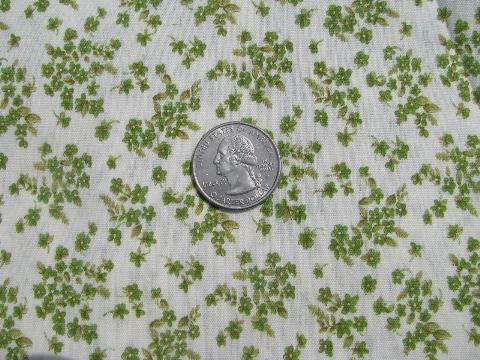 Pretty tiny floral print cotton calico fabric, irish green on white, nice for quilting! There are two pieces in this lot, both 38" wide - one piece measures 8 yards, the other measures 7 yards - so there's a total of 15 yards of 38" wide fabric is this lot. Both of these pieces have some light browning or soil marks to the selvage, otherwise clean and crisp, never laundered.